LEGAL to take with a valid fishing license. These turtles may be trapped, taken by hand, hook and line, turtle hook throughout Iowa. The possesion limit 100 pounds for live and 50 pounds for dressed turtles. The smooth softshell is a large Iowa turtle and grows to a carapace length of 14 inches in females (Conant and Collins, 1991 ). Males reach only half that length. Softshells are most easily recognized by the appearance of their carapace. It does not have the the bony scutes of our other turtles. Instead, it is flat and leathery with very flexible edges. It very much resembles a pancake. These turtles differ from the very similar spiny softshells by having a completely smooth carapace. The nose tapers to a point and resembles a snorkle. There is NO ridge in each nostril, this is the best way to differ a specimen in hand from a spiny softshell. Adult males are usually gray or brown with dots and dashes on the back. Adult females are much more drab in coloration and have large dark blotches on the carapace. Both sexes have two light lines on the side of their head; one behind the eye and one that starts under their snout. The neck and feet are not patterned. The sides of the head may have a peach or pink wash. 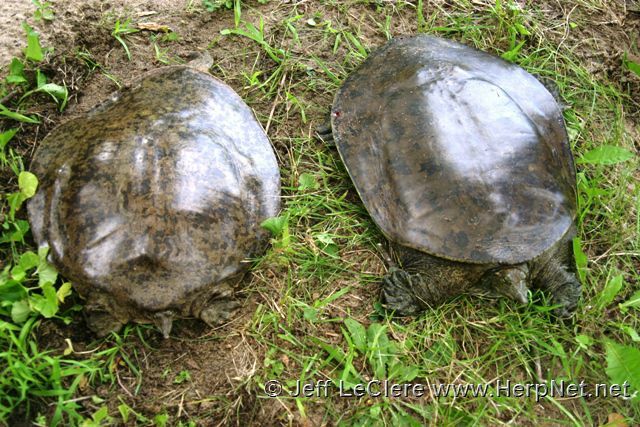 The feet of softshells have extensive webbing–much more than any other Iowa species. 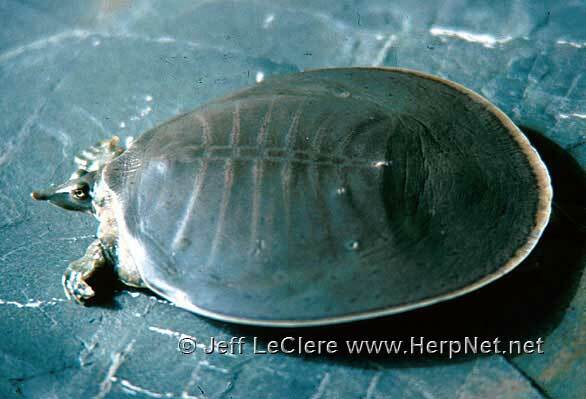 Their plastron is quite small and is white with no distinctive markings. The young are about two inches at hatching and are patterned like adult males. The subspecies of smooth softshell found in Iowa is the midland smooth softshell, Apalone mutica . The smooth softshell is found in the Mississippi and other large rivers in Iowa. Although nowhere near as abundant as the spiny softshell, Apalone spinifera, smooth softshells can be expected to occur in many of the major rivers in Iowa. Smooth softshells are found in rivers, large streams, and, rarely, large lakes with sandy or muddy bottoms. These lakes are usually close to a large river. Sandbars are important for basking and egg laying sites. They seem to prefer larger rivers and live in colonies along certain portions. These turtles are active from April and to late September or October. They bury themselves in mud or sand at the bottoms of rivers or lakes to overwinter. They are diurnal and sleep at night underwater buried in sand or mud in the shallows or among submerged trees. They are one of Iowas most aquatic turtle species. They bask on sand or mud bars or on large logs and rocks, but always at the waters edge. They are wary (more so than even spiny softshells) and will quickly dash into the water at the slightest disturbance. They are the fastest swimmers of Iowas turtles. Unlike spiny softshells, these turtles are not aggressive and will remain passive even when picked up. Sometimes smooth softshells rest buried in the sand in shallow water. They extend their necks and use their long noses as snorkels. They hunt during the day. Softshells can remain submerged for up to five hours using either dermal or cloacal respiration (Dunson, 1960). However, softshells usually do not remain submerged for more than 20 minutes while active (Stone et al, 1992b). They are capable of exchanging gas through their skin in both water and air. The smooth skin of softshell turtles are three or four times as permeable as other hard shelled turtles (Bentley and Schimdt-Nielson, 1970). Smooth softshells breed in May and they lay their eggs in June or July. Females usually dig nests on sand bars that receive sunlight. This location is closer to the water than Iowas other turtle species, so many females are not observed (and killed) on their way to lay the 12 to 30 eggs. Carnivorous mammals, however, dig up most of t1he nests and eat the eggs. The eggs may drown if the sand bar remains submerged for long periods. The brittle shelled eggs are the shape of, and smaller than, ping-pong balls. The young hatch in August or September. Hatchlings overwintering in the nests have not been observed in Iowa. The young are patterned like adult males, and have upturned noses and the sides of the carapace droop covering the hind limbs and tail like a blanket. Neonate softshells are eaten by a variety of carnivorous vertebrates including large fish. Smooth softshells seem to prey mostly upon insects, but other food such as worms, snails, clams, isopods, crayfish, spiders, frogs, tadpoles, mudpuppies, fish, young birds, small mammals, algae, and seeds have been recorded (Ernst, Lovich, and Barbour, 1994). Males appear to consume more terrestrial foods including cottonwood and mulberry seeds. Females feed upon aquatic prey, mostly insect larvae (Plummer and Farrar, 1981).